A coffee scrub sounds this familiar with you? I know it from all those famous diy’s. But since a while kruidvat also sells coffee scrubs. I was curious but also a bit holding back… Because I hate coffee and the smell of it. So now you know why I first was doubting to buy one of these scrub. But I though why not, maybe is the smell better than I expected. The coffee scrub is from kruidvat own brand and you have 4 different scrubs. Cocos, mint, almond and vanilla. Each scrub has also another purposes like relaxing, refreshing,… I choose the coffee scrub in cocos and mint. You smell the coffee good but thanks to the mint it gives it a more fresh smell. When I use this, I directly feel the mint working and giving my skin that refreshing feeling. So I’m pretty sure that this scrub would be amazing to use in the summer! It let my skin feel so fresh, I really love that feeling! Also the mint must let you feel more energetic after you use it. But I didn’t felt that, but it just was a lovely fresh scrub! So during the summer I’m sure that I will use it again! Also if you feel a bit tired is this the perfect scrub to treat yourself. This coconut scrub must give you tropical vibes under the douche. And this scrub really gives you those tropical vibes! It’s a pleasant and lovely feeling and smell! This scrub is ideal for the tropical and coconut lovers! Yes, I’m fan from these amazing and lovely coffee scrubs! They just work fantastic! So despite I hate coffee I’m a huge fan from these! Because thanks to the different variants and smells you smell the coffee not that much. So you have 4 different scrubs with each a different working. But if I can give you a little tip… Then try out the scrub with mint! This one is so so good! And it sometimes gives you the boost you need! 😉 But except the different smell and the bit different working is the end result for all the scrubs the same. Just the feeling under the douche is different. But the coffee scrubs make your skin soft and also moisturize it. And when you use the coffee scrub often it also must have a firming working… So during spring with the summer coming closer I will use this scrub once a week! One pocket you can use 2 till 3 time. 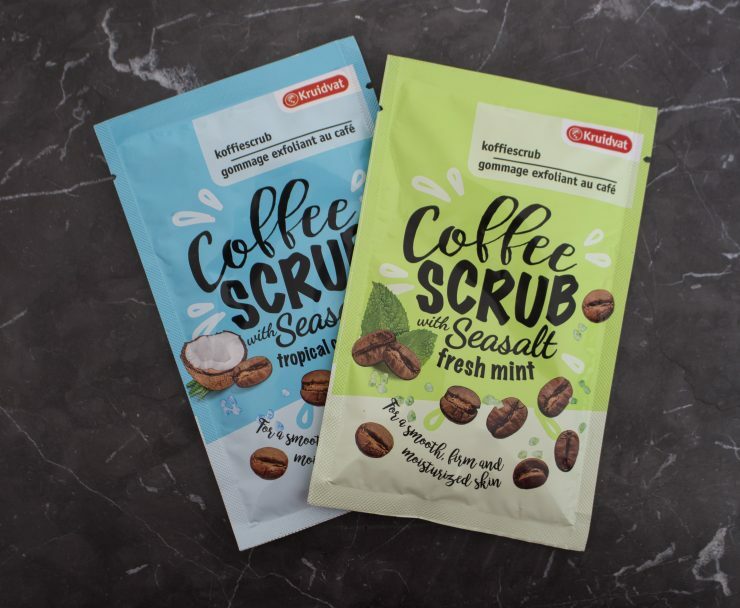 I only can say that these coffee scrubs are amazing! The coffee scrubs cost €0,99 for a pocket.